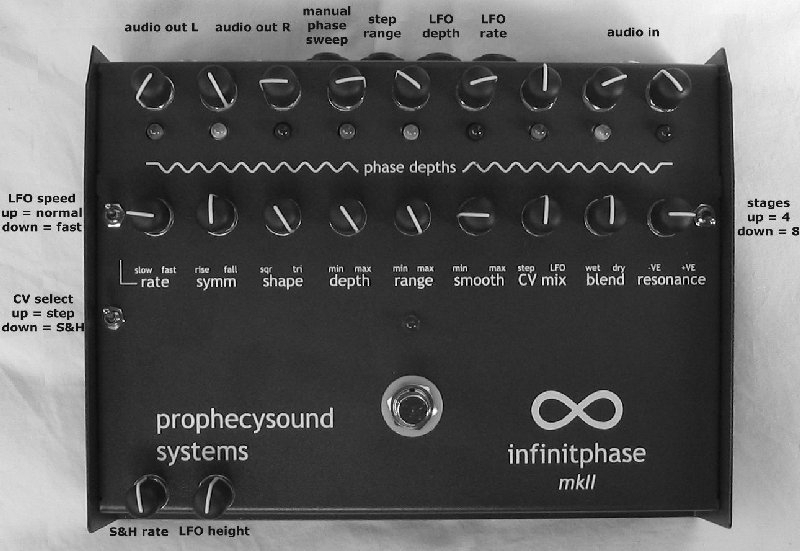 The enduring concept of a marriage between a phase shifter and sequencer continues to offer both classic and experimental sounds in a single device. 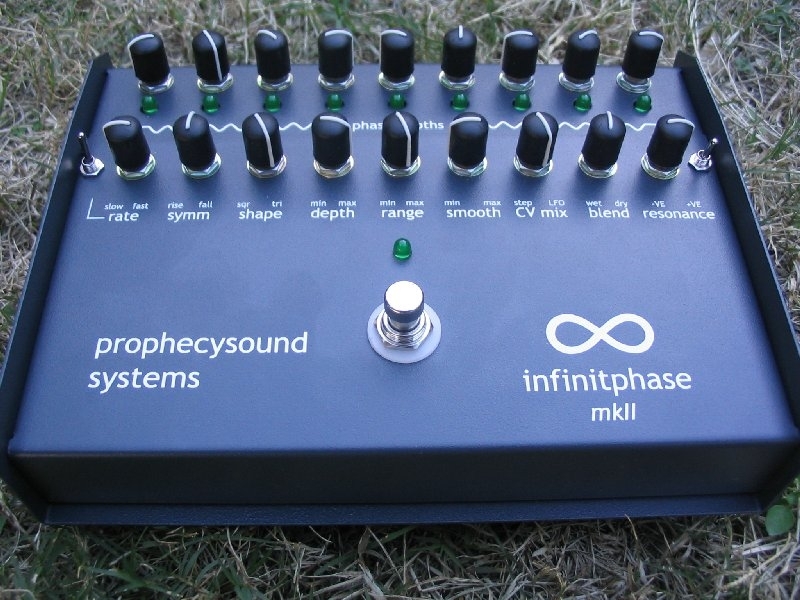 Note - as of November 2016 the Infinitphase mkII is no longer available. For different modification combinations or any extra information email Mike. Note - shipping is extra, we'll contact you with information specific to your location. 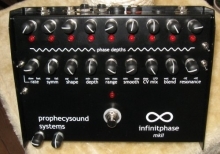 The infinitphase's audio section is based on a Mutron Biphase channel (extended to a maximum of 8 phase stages) and, along with the simple yet flexible control section, allows users to emulate traditional phase tones or explore never-before-heard filtering / phase / vibrato / S&H effects. A number of modifications to the base model infinitphase are available as optional extras. A toggle switch selecting between 4 and 8 phase stages is added for this mod, allow a 'classic' phase tone to be achieved. Additional circuitry + another output is added to provide a full stereo-imaged phase sound. Note that this modification involves making the pedal buffered-bypass; the pedal will only pass sound if the power supply is plugged in. A toggle switch is added close to the stock rate control for selecting between two LFO speed ranges - normal and high. 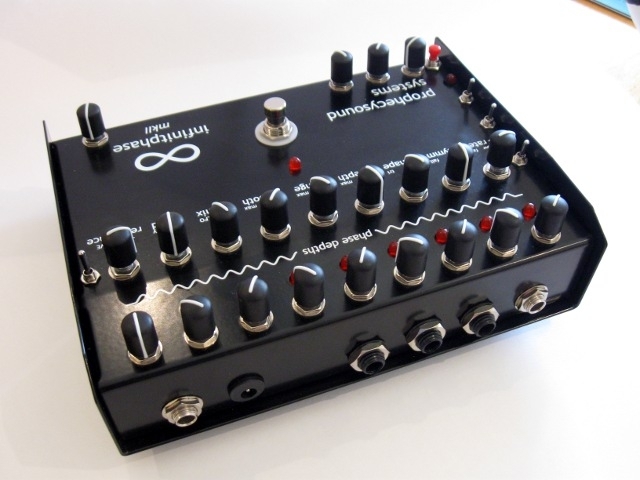 At high LFO rates the result is very similar to a true ring modulator, only the resultant tones are far more tweakable via the multitude of controls on the infinitphase affecting both the character of the modulating voltage control signal and also the characteristics of the processed audio. One, two or three 1/4" jacks can be added for external control of LFO speed, LFO depth and phase-step range control via either a volume pedal orexpression pedal. 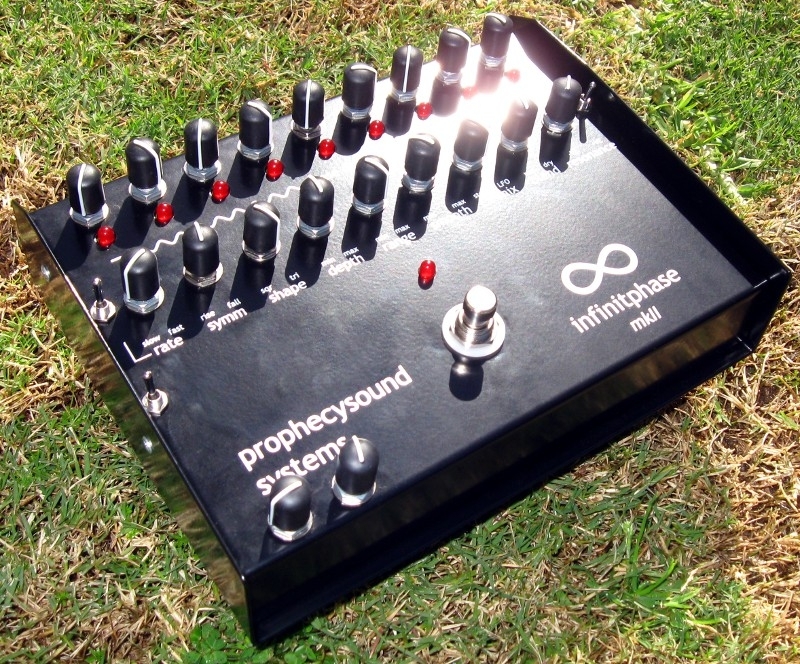 This mod consists of an extra control added to the front of the infinitphase, making it possible to adjust the centre frequency around which phasing occurs. This allows selection of phasing over lower frequencies only or higher frequencies only, or anywhere inbetween. On non-modded infinitphases the centre frequency is adjusted during the final stage of testing for optimum sweep range in conjunction with the depth control. A toggle switch is added to allow selection of the internal step phase voltages LFO, or the control voltages produced by a classic S&H circuit; a 'rate' control is also added to allow control over the rate of change of the random effect. This mod produces a close approximation of 'classic' sample-and-hold-type sounds, while still allowing the user to retain full control over the nature of the phase/filtered tones produced. When blended with the internal triangle or square waveforms via the CV mix control, many new and wonderful sounds are possible! One or more CV-out sockets can be added to allow controlling of external devices that accept CV in. The 'raw' CV out voltage is in the 0-11V range, however this can be scaled up or down to match any CV input requirements. A single CV-in socket, with toggle switch to select between internal or external control, can be added to allow the infinitphase's phasing section to be driven via external CV, or via an expression pedal (eg Boss EV-5). CV range must be in range 0-5V. A 1/4" jack is added to which an expression pedal (Boss EV5 or equivalent) can be connected, allowing foot control over the sweep of the phase. A toggle switch is also added to allow selection of the internal tri/sqr LFO, or the expression pedal sweep; or you can choose to have the sweep pedal work all the time it is inserted into the control jack. 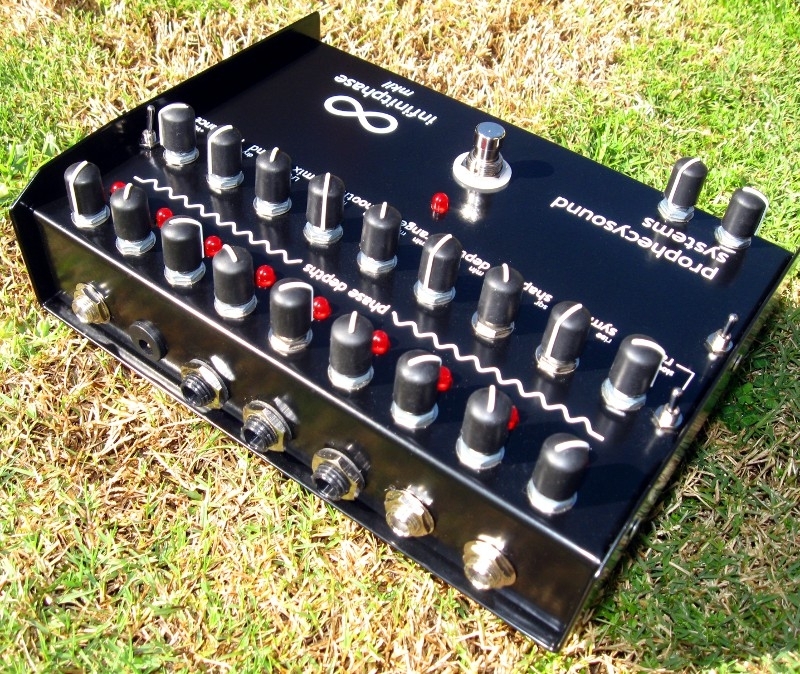 A standard model infinitphase comes with two sources of voltage control - the step sequencer and the internal LFO - with a blend control to adjust the amount each voltage control source affects phasing. With the exception of the CV in mod, which replaces entirely the internal voltage control system when activated, there is a limit of two additional CV mods. 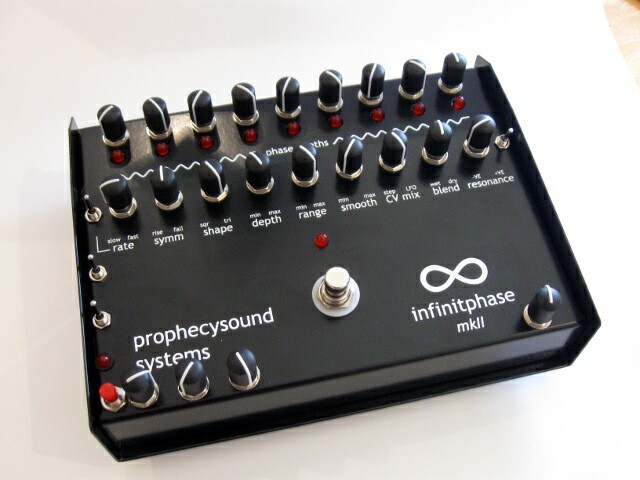 For example, a 'fully loaded' infinitphase might include both the S&H mod and the expression pedal mod. The voltage control options would then be: 1) one of the internal step sequencer OR the S&G mod AND 2) one of the internal LFO OR the expression pedal mod< Or, to put it another one, any one of two voltage control sources in each of the two voltage control groups above can be selected as active as one time.